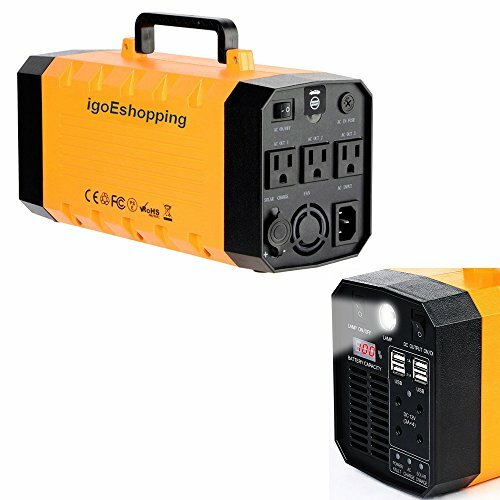 Three 110V AC outlet (for small appliances up to 500W), Four 12V DC 5.5mm ports ( 120W total) power for string light, led starry light, fairy Light for garden, wedding, Xmas or Holloween party and 4 USB ports to charge electronic devices like smartphones, tablets or bluetooth speakers,mini fridges,filming photography lighting,play station etc,like a Powerhouse around you! It's equiped with advanced intelligent jumper cables that jump start your 12V vehicle with 300 amps peak current.you will never be stranded with a dead car battery. If you have any questions about this product by igoeshopping, contact us by completing and submitting the form below. If you are looking for a specif part number, please include it with your message.